A beleaguered military command and the limited success with the Fins in which the Red Army lost 125,000 men convinced Hitler that the Soviet Union was vulnerable and could be conquered within four months. 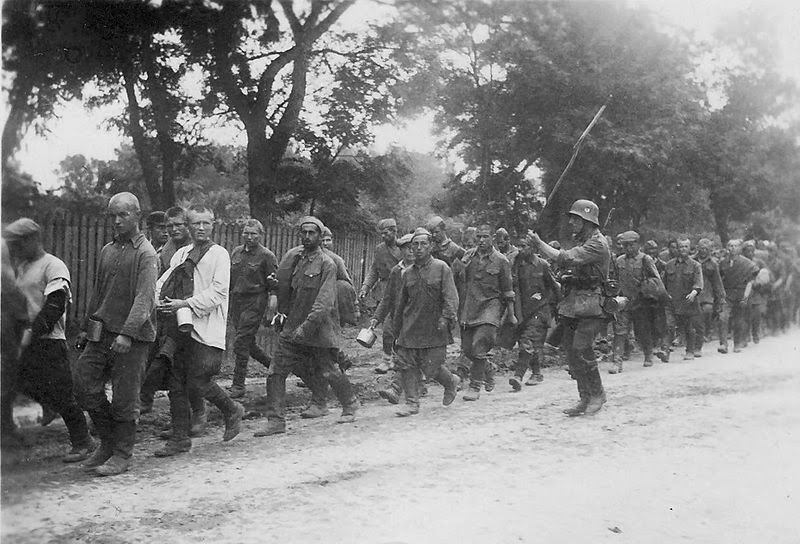 When the Germans assembled a force of over three million men to invade the Soviet Union in June 1941, their confidence was initially confirmed because the Soviet army was totally unprepared for an invasion. Stalin even ordered that the troops not take up a defensive position because such actions, he believed would be provocative to the Germans. As a result, in the first weeks of the war, the German Luftwaffe pulverized Soviet cities—Minsk, Sevastopol, Brest— destroyed the (largely defective) Soviet aircraft that had been concentrated on Stalin’s border, lost half of its industrial and agricultural capacity and 600,000 of its people. Stalin’s criminal negligence in not putting Soviet troops on combat alert and initially ordering them not to fire on the invaders make him responsible for this catastrophe. In typical style, he deflected responsibility to his “inexperienced front commanders,” who were mostly arrested, tortured and executed. 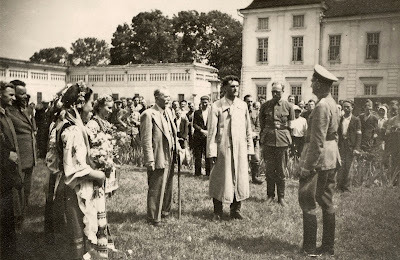 Yet he survived and part of the reason was the purge of the cream of the officer corps in the late 1930s; without it Stalin certainly would have been the victim of a coup d’état by disgruntled senior officers in the early days or weeks after the German invasion. Even with the decapitation of the military elite, Stalin sank into depression and expected to be arrested. When Stalin’s inner circle journeyed to his dacha and requested that he assume sole power, he was clearly relieved that his fears had not materialized. Stalin’s misreading of history and misplaced faith in Hitler may explain why he was blindsided by the German invasion. He never wavered in his belief that his alter ego would be so foolish as to fight a two-front war that had been responsible for Germany’s calamitous defeat in World War One. What he never understood was that with the evacuation of British forces at Dunkirk, Hitler had nothing to fear in an attack from the West. Stalin likely regarded the Soviet-Nazi Pact as a frail reed, but as long as Britain remained undefeated, Stalin believed that he had breathing room. Given Churchill’s consistent opposition to the Soviet Union having already advocated a full-fledged intervention during the Civil War to crush the infant Bolshevik regime, Stalin understandably mistrusted the British leader’s warnings of a German invasion. Stalin also rejected prescient Soviet intelligence, arguably possessing the best spies in the world that provided at least eight-four warnings of a German invasion because he trusted Hitler to adhere to the Nazi-Soviet Pact. He interpreted all intelligence reports and the actions of German deserters as provocative disinformation; he even ordered the arrest and execution of the head of Soviet intelligence for arguing with him. Given his longstanding fears of the British and his respect for Hitler, the Soviet leader was susceptible to German disinformation: Hitler assured the Soviet Ambassador to Germany that the German concentration of troops in Poland was a massive training exercise before launching major strikes in the West and that dozens of German planes were violating Soviet airspace because the pilots were inexperienced. The most remarkable evidence of German deception and skill in exploiting Stalin’s fears of the British is contained in letters purportedly written by Hitler to Stalin assuring him “swearing on his honour as a chief of state” that the German troops on the Soviet border were preparation for “seizing and occupying the heart of the British Empire—the British Isles.” To further confuse Stalin, he wrote “rumours of German occupation of the USSR are being deliberately circulated” as a way of “keeping Churchill and his circles in ignorance of our precise plans.” He added that Stalin should “not give in to any provocations that might emanate from his generals who might have forgotten their duty.” The ruse worked; when Stalin heard of German plans for invasion he wrote in red ink: “English provocation! Investigate.” One psychopath’s faith in his alter ego trumped all other intelligence sources. It turned out to be a colossal error in misjudgement, one that almost would have surely destroyed the Soviet Union had Hitler conquered it and executed his campaign of extermination. It was still a very close call in late 1941. The terrible devastation inflicted on Soviet combatants and civilians alike nearly destroyed their morale. Soldiers committed suicide or self-inflicted wounds, hundreds of thousands of soldiers surrendered prompting Stalin to condemn them as “traitors who had fled abroad,” fleeing civilians were deliberately machined-gunned by German pilots and all males between eighteen and forty five were detained in open fields at the mercy of the elements with little or no water as part of the “safety measures” imposed by the Nazis. Yet even under conditions of extreme duress, soldiers deserted or surrendered. By July 1st 1941 twenty million Soviet people were placed under German rule. Bitter memories of collectivization and the deportation of entire villages of Cossacks rendered the collective alienation so visceral that non-Russians and about one million Russians cautiously prepared to welcome the Wehrmacht and collaborate in order to contribute to a German victory. Had the German High Command not been so ideologically rigid and blinded by their hatred of the "inferior" verminous Slavs, they most likely would have defeated Stalin. Instead, they refused any negotiation with ethnic and national groups, became impervious to their “charm” or “corruption” and shamelessly resolved to exploit the conquered “niggers” as the German commander called them by denying them the benefits accorded German settlers. German soldiers were so deeply imbued with Nazi ideology and the righteousness of the race war that they regarded both soldiers and civilians alike as Untermenschen, a subhuman species of Judea-Bolshevism, a plague to be annihilated or enslaved. 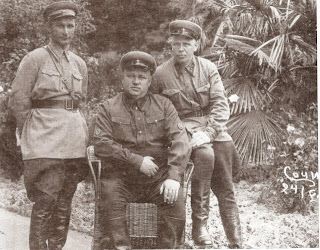 If these Slavic peoples retained illusions about the invasion and the retreat of the Red Army, those illusions began to dissipate with the savage policies of the Einzatzgruppe. With the local support of Ukrainians and Russians, these killer squads cast a wide trawl in the conquered zones to entrap and execute all Jews, Gypsies, nationalists, indigenous intellectuals and Communist Party activists regardless of their nationality. The Nazis were particularly harsh in the Ukraine. 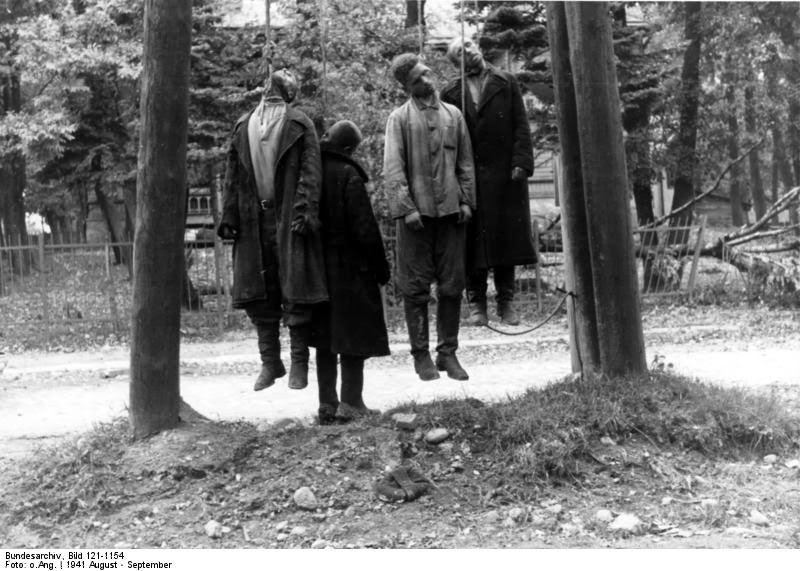 The German commander made it clear that its inhabitants, whom they regarded as the dregs of humanity, should expect the worse: “I am known as a brutal dog.…I am expecting from you the utmost severity towards the native population.” Anyone who withheld food or refused to work for the Germans could be hanged. Ukrainian peasants that admitted they could read were liable to be murdered as “intellectuals.” At least half a million were shot in the first five months of the war. As a form of resistance, partisans, who formed in the forest, attacked German installations. In response, the German High Command squandered the last remaining good will of alienated Soviet citizens with a deliberate policy of starvation, the brutal requisition of labour, and indiscriminate hangings, shootings and torture of civilians. Tragically, these Slavic and mostly non-Russian peoples found themselves buffeted by two murderous regimes and their homicidal tyrants, whose only interest resided in mercilessly exploiting them to further their own military and ideological ends.